Joe Fresh is coming to JC Penney stores. Don’t know Joe Fresh from Joe Blow? It’s the leading apparel brand in Canda, according to the NPD Group, with more than 300 locations across Canada and six stores in New York and New Jersey. 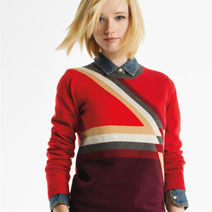 Joe Fresh is known for its inspired, affordable and of-the-moment style. In other words, it’s fast fashion that won’t break the budget. We’re talking skirts and dresses with prices from $20. And now Joe Fresh has teamed with JC Penney to roll out 700 in-store shops in April 2013. The stores will launch with women’s apparel, but the brand includes apparel and accessories for women, men and children, as well as beauty. Joe Fresh opened its first New York store in fall 2011 and its U.S. flagship store on Fifth Avenue at 43rd Street earlier this year. Get to know the brand at joefresh.com.